This project further develops my long-standing interest in institutional mechanisms of structural inequality more generally and institutional discrimination in particular. This current study explores the effects on growing ethnic and religious diversity and population ageing on institutional life in Germany, particularly on the delivery of care for older people. An analytical focus on care ethics thereby enables a structural perspective on exclusive practices. This research draws on my comparative work on legal frameworks that aim to tackle institutional discrimination as well as my writings on the emergence and scope of equality laws in Europe. Together with Therese O’Toole, I worked on a co-produced research project on Muslim women’s glocalized struggles around their exclusion from gendered spaces of decision-making. We also reflected on collaborative approaches to preventing violent political extremism, which in the UK have particularly involved women from Muslim communities. Return migration has many faces: for some migrants it is a dream that they hope to realize. Others live in fear of being returned against their will. 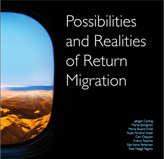 PREMIG took a broad approach to cover the diverse aspects of return migration. Within this large-scale project, I collected and conducted data analysis for the British case study of Polish EU migrants. Marta Bivand Erdal and I wrote a comparative piece on Polish migrants practices of citizenship in Britain and Norway, and edited a Special Issue of Social Identities together. My doctoral work looked comparatively at equality policy frameworks and consultation mechanisms with Muslim community representatives in Germany and the UK. It showed how structural inequalities and asymmetries are inscribed into the contemporary notions of citizenship that underpin European integration policy frameworks. I discuss these issues in my book with Palgrave Macmillan, as well as in several academic journal articles and public talks and briefings.